Caring for our hardware and accessories is very easy. Our brass, bronze and copper products are solid brass and copper. Since both are living materials without any finishes or other chemical treatments, they will oxidize and age with time (as the picture shows). Either let them age with grace, turn blotchy and darken beautifully or maintenance them by polishing them regularly. There are also sealers available on the market if you prefer to keep them looking shiny and new. To maintain finish, use a clean, soft, damp cloth regularly and sparingly use a good commercial polish to upkeep. 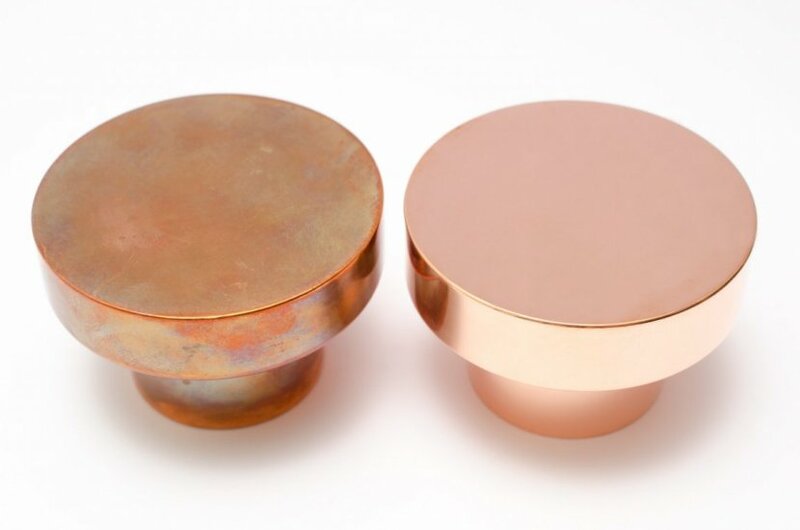 Brass, Bronze & Copper are naturally antimicrobial which means they have the ability to kill a wide range of microbes relatively quickly with a high degree of efficacy. Because these materials are able to kill off micro-organisms, all that is needed for you to remove any build-up of dirt is water. Always use a soft non abrasive, lightly damp (not wet) cloth, dampened with water only. Dry right away to avoid water-spotting. For lacquered finishes, don't use chemicals of any kind, including soaps abrasive cleaners, window or kitchen cleaners. Use of these products is damaging to the protective lacquer and may change the appearance of the piece. Our chromed series is a finely chrome-coated brass. The same chrome as used on car and boat parts. It is both beautiful and durable. Use washing up liquid or our own PUTS cleaner for best result when cleaning. Use a mild, non-alkaline soap and soft cloth. Weekly wipe down with a soft non abrasive, lightly damp (not wet) cloth, dampened with water only. There are good quality commercial cleaners and protectants available. Ensure you choose one that is not acid based and won't corrode the metal. Concrete is an extremely durable material, hence can be widely used in many applications. However, it behaves like any rock or marble and can stain, scratch or break if not handled with care. The material we use to manufacture our products is a kind of UHPC (ultra high performance concrete). The concrete used in our products is glass fibre reinforced concrete which means that it is of high quality and is high strength. When mounting do not use metal tools, screw them in by hand so as to avoid too much pressure on the material. We recommend treating the surface before first use to protect the natural and unique marble. Marble is a very beautiful but fragile stone, which is why we have chosen to design each table with a protective powder coated metal frame. When mounting the marble into the frame, please take extreme care. Especially the corners are very fragile. Always have the jelp of another persen when handling the marble and follow the instructions carefully to avoid damages. The material is a natural stone therefore sensitive to acid. Don't use acid or alkaline removales. The material is absorbing to natural products as oil etc. All hot surfaced should not be put directly on the material. Sharp objects may scratch or shatter the material. Let the honed marble saturate in a thick porridge-like mixture of soap flaskes and water. Make sure the mixture is allowed to seep into the top. Repeat 3-4 times in a week the next two weeks. The polish that coats the polished marble acts as a type of protection, therefore allowing it to withstand stains. Clean the marble with a damp cloth or sponge. Immediately clean spills to avoid staining. Brushed surfaces should not be cleaned with polish containing abrasives, as there is a risk of the surface turning shiny. Our own cleaner PUTS is a good and gentle option to use on brushed surfaces for example. We offer PUTS cleaner that is perfect for cleaning brass, copper, chrome and aluminium products. It works on most metal surfaces as stainless steel, chrome, copper, brass, aluminium, nickel, silver and gold. If you're unsure of how to care for an item you are more than welcome to contact us at ahoj@monobrand.cz with any further questions. But generally good maintenance with a lightly dampened, soft non abrasive cloth will help keep your items in good shape for years to come. We love to share the latest news. Sign up to be the first to learn about new products, exciting events, special campaigns and much more.